In my previous article, I promised that I was going to show you how to build and use a VM template. Before I get started, I want to take just a moment and show you one more component that is useful when creating a template. I already introduced you to the Library workspace in one of the previous articles, but I haven’t yet talked about the library share. A library share is really nothing more than a file share that is exposed through the Library workspace. To give you a better idea of what the library share is, what it looks like, and what it does, take a look at Figure A. In this figure, I have the Library Workspace selected, and I have selected the Library Servers container within the console tree. Figure A: Library shares are exposed through the Library workspace. As you can see in the figure, I have selected the Library Servers container. Just beneath this container is my library server. I only have a single library server, but Virtual Machine Manager allows for the creation of multiple library servers. If you look beneath my library server (VMM2012R2.MGMT.com) you will see a container called ISO. The ISO container is a library share. You can store just about anything that you want in a library share, but I am using the ISO container to store installation media in ISO format. Now, take a look at the main window. Because I have selected the Library Servers container, a number of different library resources are displayed including virtual hard disks, ISO files, and even frameworks. If I were to select the ISO container, Virtual Machine Manager would display the files within it. 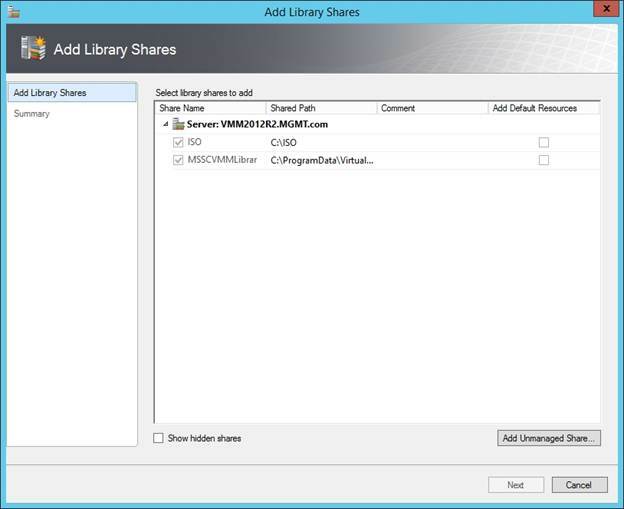 The first step in creating a library share is to create a file share on the server. 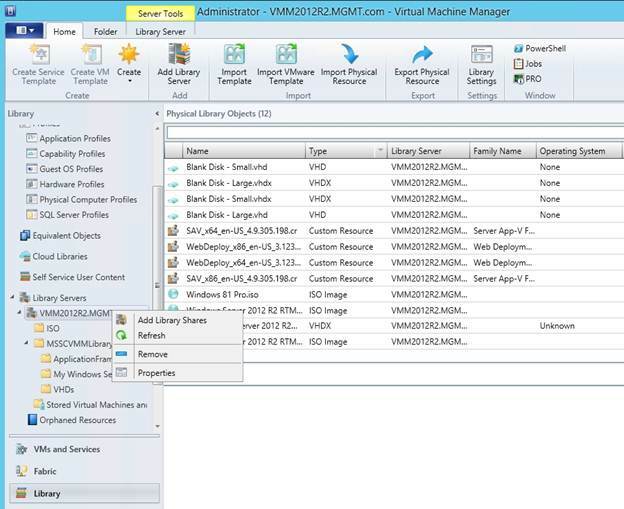 You can call the folder and the corresponding share anything that you want, but the folder needs to reside on the Virtual Machine Manager server. The permissions requirements for the share vary from one organization to another, but as a general rule you will want to grant the Administrators group and your RunAs account Read / Write permissions for the share. Once the share has been created, go back to the Virtual Machine Manager console, right click on the container representing your library server, and then select the Add Library Shares command from the shortcut menu, as shown in Figure B. Upon doing so, you will see the Add Library Shares dialog box. Select the checkbox corresponding to the share that you want to add to the library, as shown in Figure C, and then click Next, followed by Add Library Share. Figure B: Right click on the library server and then choose the Add Library Shares command. Figure C: Select the checkbox corresponding to the share that you want to add. Now that all of the various components are in place, I want to go ahead and build a virtual machine template. The procedure for doing so might seem a little bit odd to anyone who has never done this sort of thing before. The first thing that we have to do is to create a virtual machine that will act as a model for our template. The template is generated from this model, but we can’t use the model itself as a template (at least not using the method that I am about to show you). The model virtual machine should have the operating system installed and fully patched. It is important that you do not join the virtual machine to a domain. You may be able to install some applications on the model virtual machine, but some applications have trouble with the process that we are going to be using to create the template. Therefore, you will have to experiment with including applications in the template. It is extremely important that you create the model VM from scratch rather than using an existing VM, because the model VM will be destroyed by the template creation process. To create the model VM, select the VMs and Services container and then click on the Create Virtual Machine button found on the ribbon. 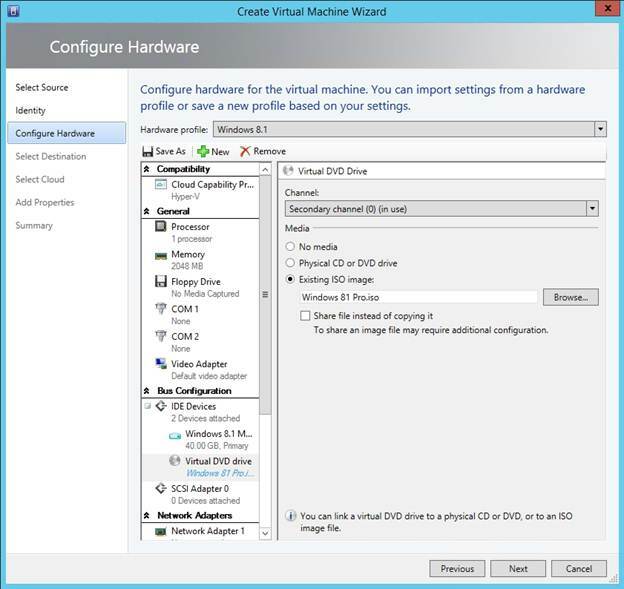 Upon doing so, you will see a screen asking if you want to use an existing virtual machine, VM template, or virtual hard disks, or if you would prefer to create the new virtual machine with a blank virtual hard disk. Choose the option to use a blank virtual hard disk and then click Next. 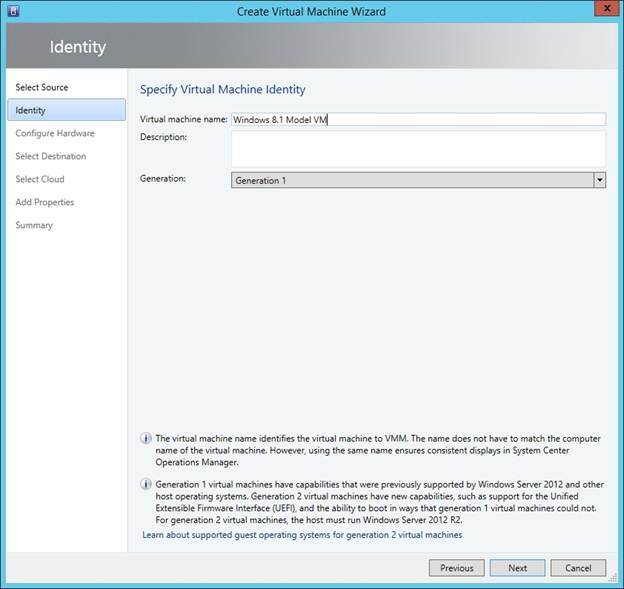 Next, you will need to enter a name and an optional description for the virtual machine. 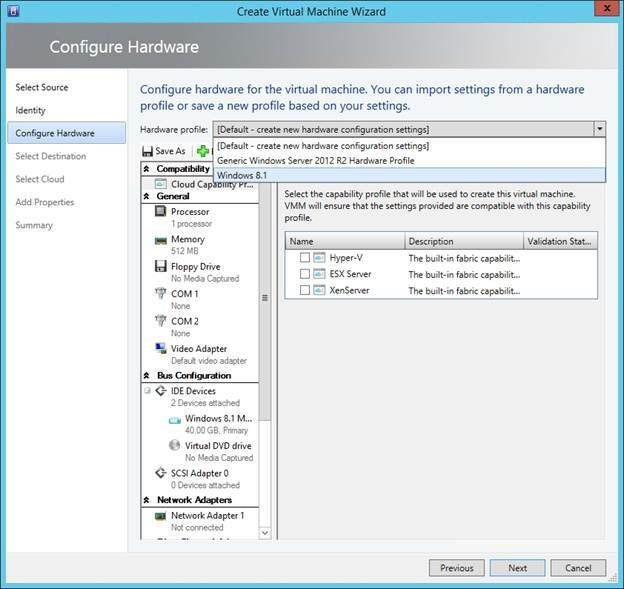 You will also need to choose the virtual machine’s generation. Make your selections as shown in Figure D, and click Next. Figure D: Enter a name for the new virtual machine. Click Next and you will be taken to the Configure Hardware screen. There are a couple of different things that you need to do while on this screen. First, go ahead and select the hardware profile that you want to use from the Hardware Profile drop down list, as shown in Figure E. If you do not see an acceptable hardware profile then you can either go back and create one, or you can manually configure the virtual machine’s hardware. Remember however, that it is best to use hardware profiles whenever possible. Figure E: Choose the hardware profile that you want to use. The other thing that you need to do on this screen is to connect the Virtual DVD Drive to the Windows installation media. Remember that ISO library share that we set up earlier? Now is a good time to copy your Windows installation media ISO files to it. Once your ISO files are in place, select the Virtual DVD Drive option and then set the Media option to Existing ISO Image. You can then select your preferred ISO file from the library. You can see what this looks like in Figure F.
Figure F: You will need to link the Virtual DVD Drive to an ISO file. Click Next and you will be taken to the Select Destination screen. 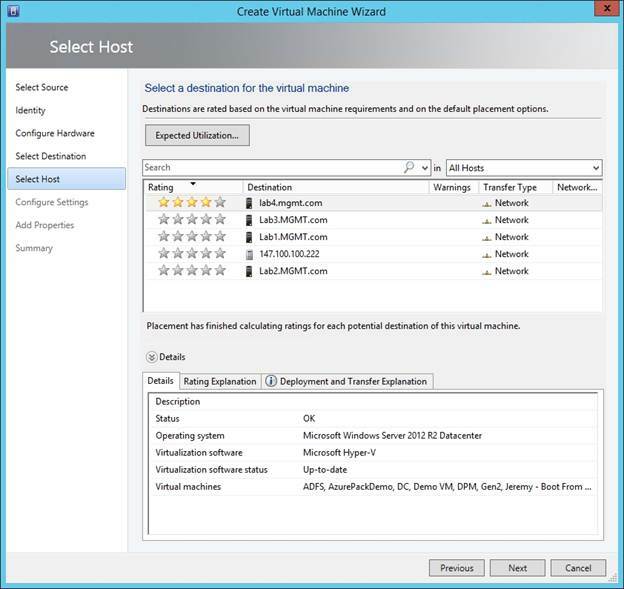 Choose the host group within which you want to place the model VM and click Next. You will now see the Select Host screen, as shown in Figure G. Choose the host where the model VM should reside and then click Next. Figure G: Choose the host on which the model VM should reside. Now, go ahead and verify the virtual machine path and click Next. You should now see a screen asking you to select a network adapter. Make your selection and click Next. Make any adjustments to the virtual machine properties and click Next one more time. At this point you should see the virtual machine Summary screen. Take just a moment to make sure that the summary information appears to be correct and then click Create to create your model VM. Up to this point, we have created a model VM that will be used to produce a virtual machine template from which we can automatically create new virtual machines. Go ahead and configure the model virtual machine in a way that works for your organization, but do not join the VM to a domain. 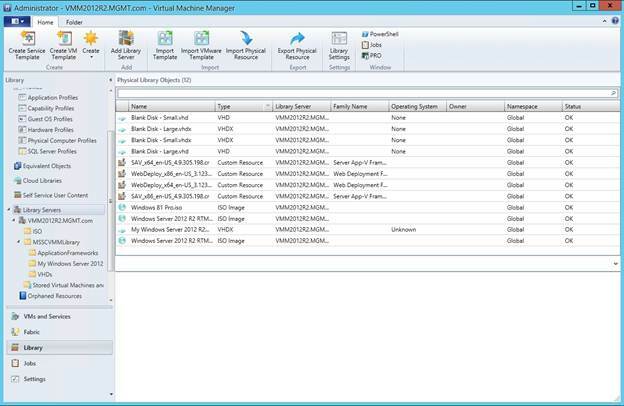 In Part 10, I will show you how to convert your model VM into a virtual machine template.